It’s difficult to tell from the model but this place was really in the middle of nowhere - a 45 minute drive in to the hills from the nearest main road. 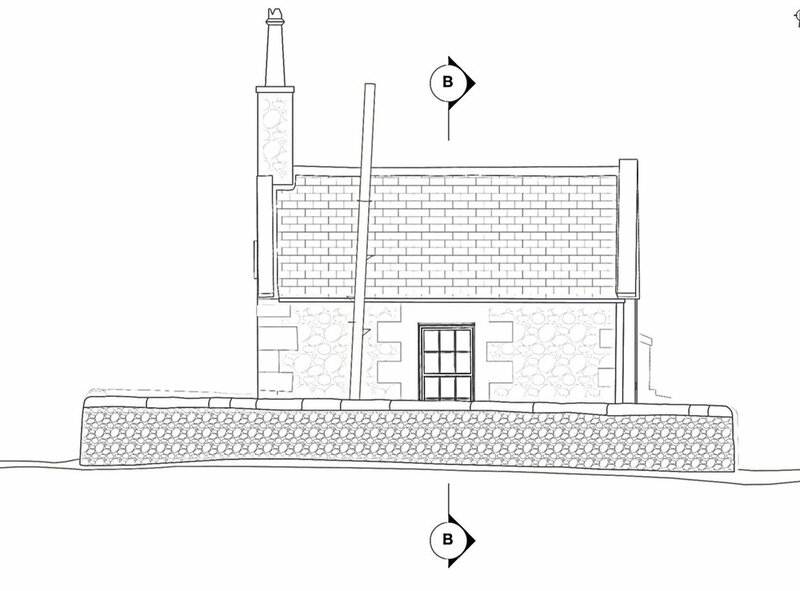 Still, when you see the Revit model from this measured building survey, you can see that it was entirely worth it. 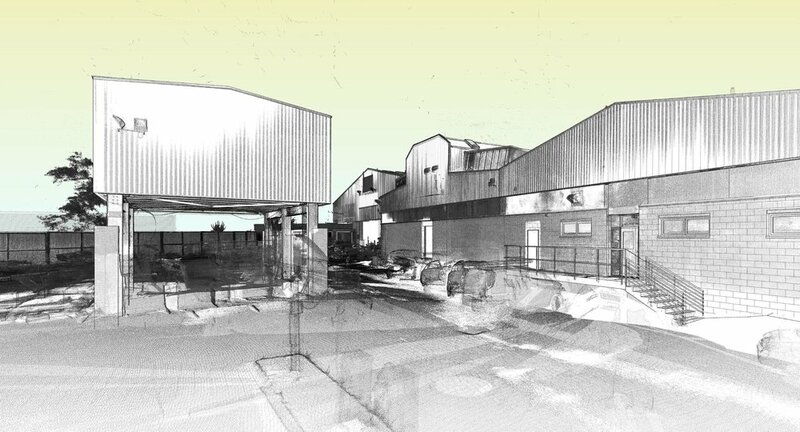 This was a really exciting project: the 3D modelling of a large complex warehouse, two historic buildings and a couple of smaller warehouse buildings. The project also included a topographical survey of quite an extensive area. As always, we combined some of the best technology on the market to collect the data… including Aimee, the flying robot deployed by our aerial team. Total site time: 2 days. 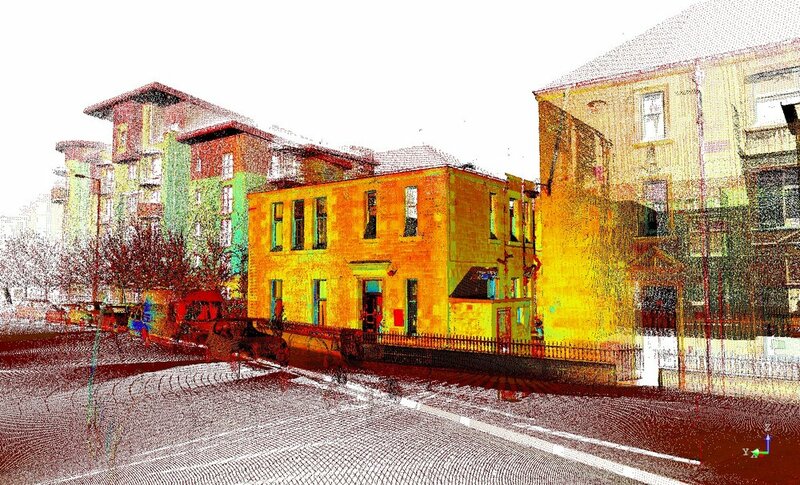 A total of 3 full days 3D laser scanning using a Trimble Tx8 and over 200 individual laser scans; the Aura team were sure to capture every aspect of the Falkirk Library so that the building could be modelled in Revit. The scan data was used to meticulously model the internal space, including decorative features and staircases. Our client was delighted with the level of detail and accuracy of the final submission. This point cloud model represents nearly 100 million data points recorded from the air. Each full-colour data point is recorded to an accuracy tolerance of less than 30 millimetres which is almost topographical survey grade accuracy. Here's the proof: our detailed topographical survey overlaid upon our point cloud model. You can't see clearly from this image but trust us, common features coincide perfectly. Because we're just scratching the surface of the power of point cloud modelling, Aura is quite rapidly moving away from traditional topographical survey and working toward a work flow that automates most traditional survey activities. Our aim is to optimise turn-around while giving our clients far richer, more powerful data sets than they will have experienced before. The level of detail that can be obtained from the air is outstanding and accuracy tolerances are becoming more refined with every survey that we deliver. The above isn't a photograph, it's a still from the less than 30mm accurate 3D model. Our models are used for planning, community engagement, 3D printing, design, contextual analysis, view point analysis and just about any CAD related workflow that can be imagined. Above is another still from the point cloud, this time taken directly from AutoCAD. 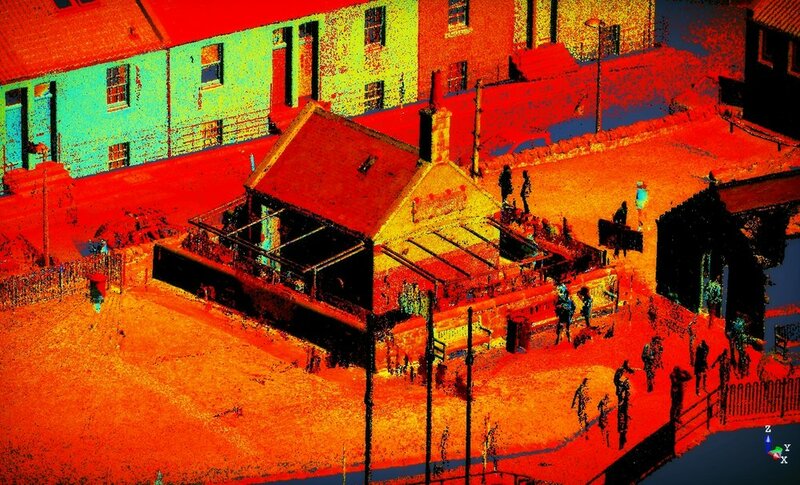 Many of our clients - architects and engineers - are astounded by the possibilities made available by modelling directly from point cloud information. This site near the centre of Edinburgh equates to a 47 acre collection of buildings nestled amongst mature trees. For the survey, our land team installed a tight network of ground control points and our team in the air over-flew from Blackford Hill. A photo-realistic point cloud model of the topography of the site (including the train line and all major roads beyond the site perimeter) was produced by photogrammetry and passed to the architectural team for master planning. Because the site is steeped in history, the survey also included Normalised Difference Vegetation Index (NDVI) deliverables: from an infrared camera, subtle differences in vegetation density can be used to detect ancient structures below ground level. 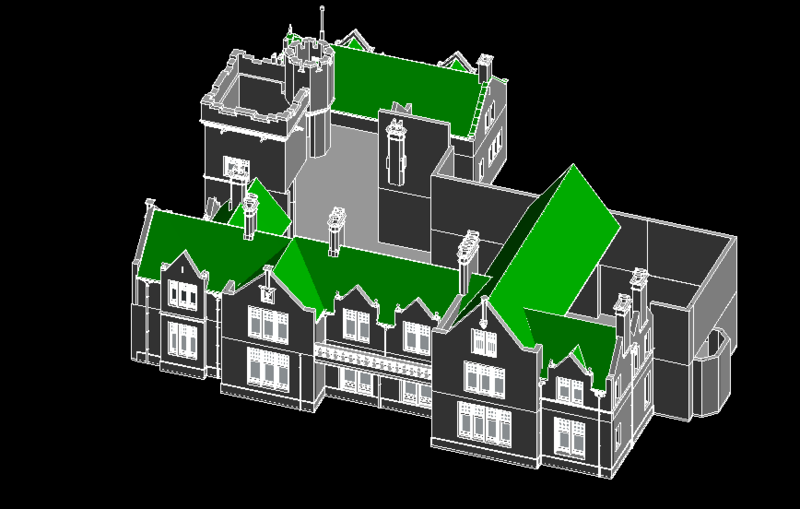 The brief: delivery of a full suite of CAD plans which included four complex elevations, three irregular floors, and a large topographical survey. As always, the Aura team unleashed the most innovative technology: two types of laser scanner, a total station, and a GNSS unit. This combination enabled us to capture the the house and grounds in staggering detail. What's more, combining these technologies enabled us to complete the full survey in a day - the team leaving with so much data that they would never need to return to site. Once the point cloud data was registered in Trimble Realworks, it was exported in .RCP format for use in Autodesk Revit. In Revit, the complete structure was modelled, beginning with the elevations as captured above and working inward to model the interior. While our client has requested the delivery of a suite of 2D CAD plans, taking time to produce a complete Revit model meant that we could easily extract the elevations and plans. Using both Trimble TX8 and TX5 laser scanners, our team were charged with the task of surveying the entire steel structure for the Dunbar Energy Recovery Facility. Our client needed to know the verticality and level of each steel member. This was made easy by scanning the structure. Complete topographical survey delivered to our client as a point cloud model. Control established utilising Trimble RTK technology. This image represents a photorealistic 3D point cloud model (generated by photogrammetry) of an 800 hectare site. Our team installed a tight network of ground control points to bring the accuracy of the model delivered by the air team to within 30mm. Overall flight time was approximately 4 hours. To have surveyed the same site from the ground would have taken weeks! The model was used by our client in LSS to run various analyses relevant to the redevelopment of the old quarry site. This was a great little project that represents our smallest 3D Laser scan project to date. Around the Rocketeer Restaurant in North Berwick is a low stone wall. Our client, IPIG, have been appointed to design and install a structural glass canopy round the building. To do so, IPIG have to know the exact profile of the wall... Cue the Trimble TX8. From the scan date we produced a 3D model of the building and an extremely detailed mesh model of the wall profile. From these entities, we struck elevations, floor plans and sections for delivery as 2D CAD models in line with our clients requirements. It may be a tiny elevation but it's an extremely precise one. Importantly, the profile of the top of the wall reflects the true profile to millimetre accuracy - something that would be extremely challenging to achieve without 3D scanning. Because we enjoy what we do, we obviously had to laser scan our HQ. From the point cloud model we then started to design our space. The work-flow between Tribmle Real Works and Trimble Sketchup is incredible. In no time we had walls, windows, skirting-boards, and sockets in the model. All we had to do from there was start designing. While some might view Sketchup as a "basic" tool for architectural design, there's a very real reason that Trimble paid millions to Google to acquire it: from an As-Built modelling perspective, it's intuitive, precise and, really quite powerful. Plus, we got to dip in to the model library to figure out what we are going to do with our furniture. Three floor plans, six elevations, a topographical survey and a roof plan: all delivered ustilising Trimble 3D scanning technology and a drone. With over 60 individual scans and nearly 200 million data points combining to give a complete point cloud model of the church, the Aura team could be sure that we didn't miss a thing when conducting our survey. Sections were taken through the point cloud to produce floor plans on all levels. Interestingly, we found that the extension to the church was built so that it wasn't square to the original building. This might not have been picked up if we had used other technologies. Our client was keen to capture the roof but, because it was a tight site with limited roof access, scanning wasn't an option... so we unleashed the Sensefly, fixed-wing drone. We launched from Portobello Beach on a quiet morning and, setting the Church as a 'point of interest', the drone did its thing completely autonomously. Cleaning the model of the ground points, our team could easily produce elevation drawings and sections. Each drawing was produced from the point cloud data and images recorded by the scanner. Despite views that could have been plucked straight from an episode of Game of Thrones, this was one of our most demanding surveys. With no network coverage, there was no GNSS so out came the trusty M3 Total Station. We worked tirelessly all day, surveying through trees, over mountains, through marshes, even wading rivers until about 7:00pm. Then, the midges descended. With two hours until we reached the top of the pipeline, we battled through clouds made up of millions of the tiny buggers. By 8:30pm the cloud could be seen from 100 meters away - Steve utterly engulfed by the daemons of the West coast as he manned the M3. Things got tougher as the clock approached 9:00pm and the September sun began to set. We were breathing in midges; quite genuinely chocking on them. And then... the last point was recorded. No time for neat packing, the car was loaded in 15 seconds - if anything was forgotten it would be replaced. The raging cloud of midges followed, fighting to find a gap in to the car where their delicious meals had sought sanctuary. The car hit the main road and we were away leaving this horrendous experience behind us. At Aura, there's no excuses. We'll get it done. Chesser House sits on Gorgie Road in Edinburgh. It's a big building. So big, in fact, that you can see it from lots of places across the city. We were asked to produce CAD floor plans (with slab and sofit levels) for all eight floors following a strip out so that the ex-office building can be re-purposed. If surveying this massive building wasn't challenge enough, we wondered if we'd be able to challenge ourselves even further (we do like a good challenge). 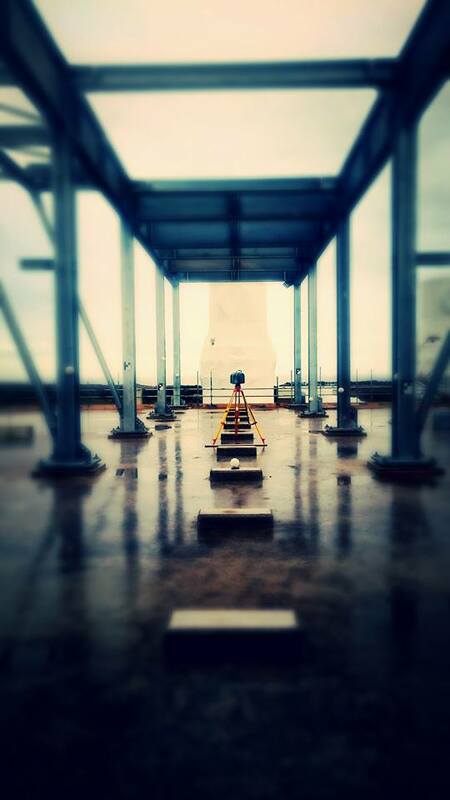 We wondered, could we conduct the site survey works in a day? Well, with careful pre-planning and deploying innovative 3D laser scanning technology, it turned out, yes. Yes we could. In a day we conducted 125 individual scans, leaving site with a total of eight millimetre-accurate point cloud models representing each floor. Added to the achievement was that this was all done by our lead building surveyor while he was completely run down with a virus and while, at some point, he was locked in the boarded up building completely and left alone after the site crew forgot he was there... fortunately the site manager sprang in to action and he was out in no time. In the end, the results made it all worth it. From these incredibly detailed point clouds we produced and entire suite of 2D CAD plans showing slab and sofit lavels for submission to the architect who will no doubt turn this tired old building in to something beautiful! 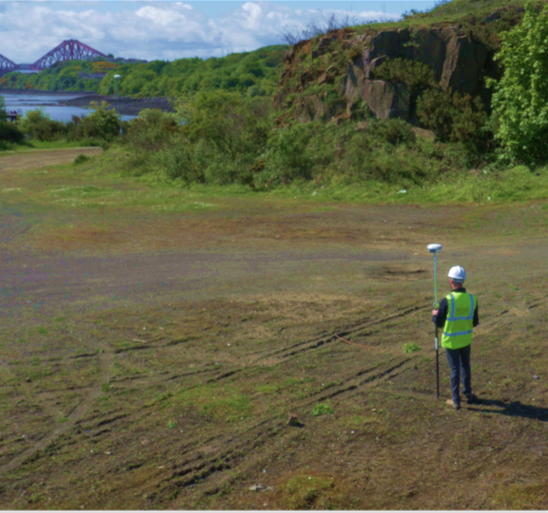 This survey was in two parts: a complete topographical and building survey and a drone fly-over to create a 3D point cloud model of the entire site. 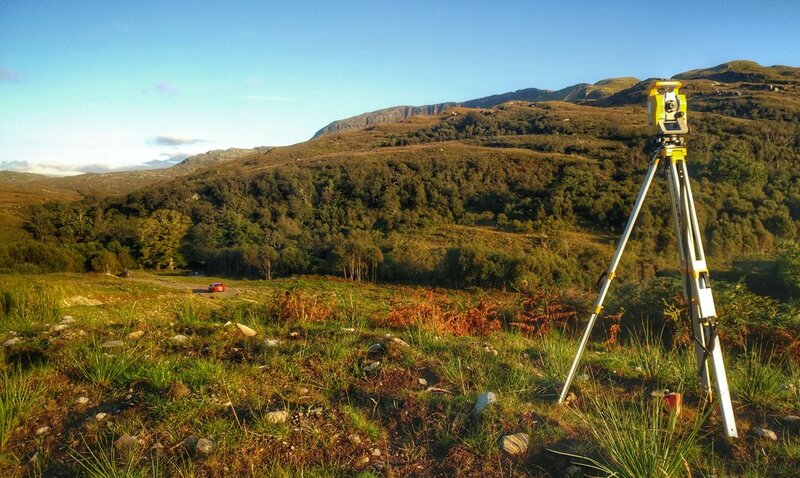 The topographical survey was conducted using two Trimble GNSS RTK rovers and a Trimble S-Series total station. The data was brought together on Trimble Business Centre, from which control points were taken to build the point cloud model from the UAV photography. 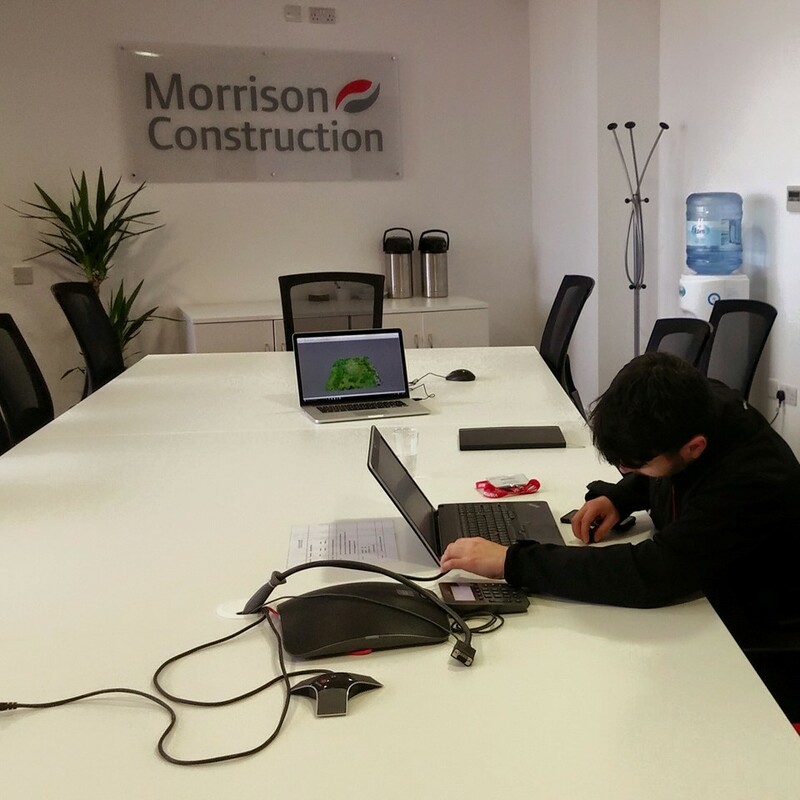 Michael setting up before the Aura team presented to staff at Morrison Construction following an aerial drone survey for a high school site in East Lothian. We produced a Cloud Model using photogrammetry which was subsequently used by the architect for planning. We've since delivered a number of other aerial surveys for High School sites. Working closely with landscape architects, Twig, we delivered a complete topographical, boundary and tree survey for this site outside of Stirling. Due to the size of the property, the changes in levels and loads of nooks and crannies, this still remains one of the most complex surveys we have delivered. We flew a DJI S1000+ armed with a Panasonic GH4 over this site in West Lothian. The combined result of 180 images taken at 50m altitude was this point cloud model used by our client for planning and visualisation purposes. This may look like an image of a cliff but it's actually a screen grab of a 3D point cloud model produced using photogrammetry. We surveyed and modeled this old quarry using Photogrametry. About 100 images were taken using a DJI S1000+ with a Panasonic GH4 at an altitude of 100 meters. This unusual and intriguing property has a complicated layout. The client required floor plans, elevations and a total of 11 cross-sections. With this complicated layout, the only way to ensure near perfect accuracy was to laser scan both the internal and external elements; producing a 3D model from which we could easily create floor plans, sections and elevations. We used a Trimble TX8 3D laser scanner, picking up every aspect of the building from inside to out. We were also able to supplement topographical information collected using RTK GNSS rovers with scanned data for the topography. A total of six elevation drawings, elven cross-sections and five floor plans were produced using the scanned data. This old steading building near Perth is ready for development. On a cold, rainy day our team completed a full floor plan, elevation and topographical survey. Our client was delighted with the results. Sometimes you just can beat survey life. This is a still taken from a sunny March morning in a beautiful setting. Our client was planning to do a complete overhaul of their garden, starting with a topographical survey to enable their architect to put together some design proposals. One of many stills from Twig Architecture's design proposal. The new design included a pond with a gaziebo and a japanese contemplation garden! Beautiful. Our survey of the new AmazonFresh unit (before Amazon had taken the lease) at the J4M8 site. The shoe giant, "Schuh" is next door. We used two Trimble GNSS RTK units and an S-Series total station to turn around what, at the time, was our biggest survey for our largest client. While our surveyors are hard at work surveying the topography on the ground with Trimble gear, our aerial surveyors are recording data from the air. This picture was taken from the DJI S1000+ during a large survey outside of Edinbrugh. We were really excited to be part of the beginnings of the Edinburgh City initiative to turn a forgotten piece of history in to something truly valuable. Aura conducted a complete elevation survey, contextual topographical survey and floor plan survey of the tired looking former Leith tram terminal and office. Our drawings will be used by Reiach and Hall Architects to turn the site in to a hub for Edinburgh creatives. The new site will include studios, retail units, workshop space and a social enterprise cafe. Here's what you need to know about this project: link.